What’s the one element that can make a story a megahit? A complex and compelling character at the center of the action is the thing that can blast a story into the blockbuster stratosphere. You can quickly create characters that connect with Character Writer, a development program that combines the power of the Enneagram personality-typing system with story-generating tools to help you create fully realized characters and perfectly organized plots, all in one easy-to-use interface. The role shouldn’t define the character, the character defines the role. 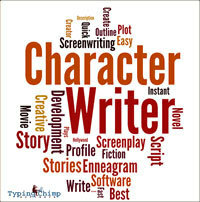 So instead of starting with 8 or fewer stock personalities, Character Writer offers 70 complex types that allow you to drill down and define each individual character’s spine. Plus, the unique "Psychology" section lets you browse a large list of traits based on the American Psychiatric Association’s distinguished DSM-IV manual. You can then generate full profiles as a starting point for building out the plot and world your characters will inhabit. Character Writer also includes a built-in generator and organizer (with a billion different possibilities!) to create your story. Once you've nailed your basic story structure and story skeleton, you can edit, develop and organize it until it's perfect. Character Writer’s "Writing Mode" keeps the program in the corner of your screen to make notes about your characters and have their traits and behaviors at your fingertips—no matter what program you use to write your story. Whether you’re working in Final Draft, Microsoft Word, or any other writing and formatting tool, you’ll always have access to your character profiles throughout the writing process. Ready to start creating complex, relatable characters that elevate your story to the professional level? Pick up your copy of Character Writer today! Download: Compatible with any operating system that runs Java 6: Windows, Linux, Solaris and 64-bit Mac.